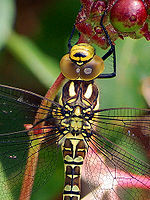 The Southern Hawker Dragonfly is resting on the leaf of the plant. The Southern hawker dragonfly is a very brightly colored species of dragonfly with the scientific name Aeshna cyanea. It shows the dignity and the beauty of an insect which is very unpopular and not beautiful enough compared to the other insects like butterflies. The wing of this dragonfly makes the look much better and very useful to the flight of the dragonfly. It lives in ponds or small lake that has water so it can survive. Most interesting part is that how the Southern hawker dragonfly could capture their food. The survival of insects are one of the most fun thing and creative things in nature that God has created for us.Aeshna means ugly or misshapen. Cyanea means dark blue. The male dragonfly has a little bit of brightness in dark colored body and female has markings with brown color. They fly around livestock and collect food from other bugs in place. These dragonflies use their large eyes to see in many direction at once to detect its prey. 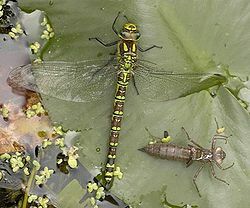 These dragonfly's adults are usually can be recognize in hot temperature areas. Also they catch other insects as food for their nutrition, they use their legs to grab food for them and usually eat them from wings. Below their heads, you can see jaw that can swish it to capture those fast insects to eat. those are called mask. The Southern hawker dragonfly performs sexual reproduction finding mates in late summer. The male dragonfly uses a pair of claspers to grab the female's back. If, female likes the male's attention, she turns her body to male's abdomen where claspers are. It makes rough wheel formation. This situation is happening during the flight. The mating usually starts and ends 2 min to 1 hr. Normally it takes 20 min. The female then places her eggs on floating vegetation including moss, reeds, and also rotten wood. While the female dragonfly needs some security, the male dragonfly fights away the intruders and predator. The male dragonflies also gets really cautious and curious too. They make their living by protect their species to organize their babies. Also, the male one has great impact on how female lay their eggs. When male and female dragonflies are mating the male dragonfly take out the last suitor for female dragonfly. Also, male is trying to protect the female while she is working on when the sperm of the that male dragon is reproductive to the female completely. 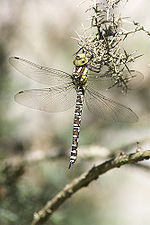 The Southern hawker dragonfly usually lives the warm climate countries. They find themselves in Western Europe usually. Specially in United kingdom in South. 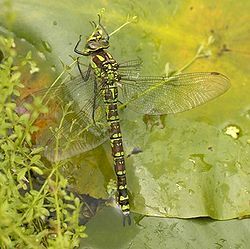 There are 44 species of Southern Hawker dragonfly in United Kingdom officially. They can be shown and also emerge different times of warm part of the year. In middle of the summer, they show up most of the time than any other warm seasons. It is difficult to see these dragonflies in large lakes than smaller ponds or lakes. Also they live in muddy woods and near to the tree that close to the water. Dragonfly Species Unknown author, Animal Corner, Accessed in November 15, 2010. British Dragonfly Society Unknown author, BDS, July 31, 2010. Wildfacts Unknown author, BBC, accessed November 15, 2010. This page was last modified on 17 August 2014, at 02:21.